Although you may be excited to plant your garden, sometimes it's best to wait. While cool-weather crops like peas and broccoli tolerate lower temperatures, vegetables like tomatoes require warm temperatures to develop properly and set fruit. Cooler temperatures can cause irreparable damage to many garden plants, especially tomato plants. Tomatoes love warm weather. As a result, temperatures do not need to get anywhere near the freezing to permanently damage growing plants. Weather cold enough to damage tomato plants is defined two different ways. Daytime temperatures consistently below 70 degrees F is the first definition. Night temperatures that fall below 60 degrees F is the second. Either scenario will damage tomato plants over time. Tomato plants exposed to cold temperatures sustain damage several ways. One indication is flowers falling off of the plant, known as blossom drop. Cold weather also compromises root system development, leading to absorption problems as the plant grows. Inadequate root systems lead to phosphorus deficiencies. Tomato plants need phosphorus to develop blossoms and set fruit. Cold weather combined with wet weather create an environment where fungal diseases like gray mold can quickly develop. If your tomato plants have been exposed to cold temperatures, check them for damage. Check your plants to see if they are producing flowers that stay on the plant. Root damage is evidenced by stunted growth, or you may find that your plants are dying. Plants suffering from phosphorus deficiencies will have leaves with purple veins. For plants that are severely deficient, the entier plant will have a purplish hue. Gray mold prefers to attack parts of the plant that are already distressed or damaged. It will appear on both leaves and fruit, looking like a gray or tan feltlike covering on the affected area. Most plants that sustain cold weather damage are unlikely to recover. Plants infected with gray mold can't be treated and must be destroyed to protect uninfected plants. Don't compost debris from gray mold infected plants; the composting process won't destroy mold spores and future plantings will be exposed. Plants with compormised root systems will be smaller and more susceptible to disease. For plants showing symptoms of phosphorus deficiency, side dress them with fertilizer. The best way to deal with cold weather damage to your tomato plants is to prevent it as much as possilbe. Check with your local county extension office for their recommendations. They will know the best time to plant in your area. Mulching tomato plants with dark plastic warms the soil and helps it retain heat. 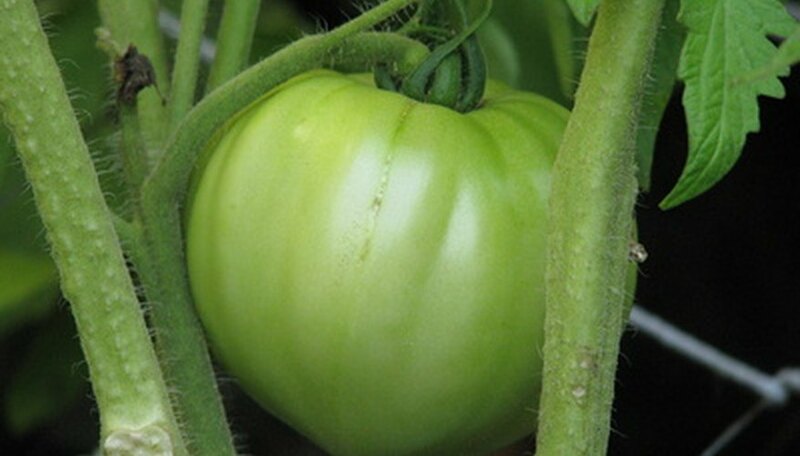 Experts at tomatogardeningguru.com also suggest planting tomatoes close to dark, semi-solid fences so that they will reflect heat and keep plants warmer. Untreatable plants should be destroyed immediately. Plants with treatable symptoms should be addressed quickly to avoid losing the plant or spreading disease. Tomato plants that are exposed to unseasonably cool temperatures are more susceptible to disease and crop failure. Many of the problems plants experience because of cold weather are very difficult to treat, if at all. Tomato plants that survive will produce fewer tomatoes that are lower quality than ones produced by healthy plants. What Are the Causes of Tomato Dry Rot? What Are the Causes of Brown on Tomato Plant Leaves?